On this day in history in 217, the Roman Emperor Caracalla died. Well, he was assassinated. But, that's the same thing. Anyways, the world rejoiced. Or at least the Roman world rejoiced. That guy was a right evil git. Caracalla's rule was full of massacres and persecutions, and death, murder, kills. Caracalla was the eldest son of Septimius Severus, who went on to kill Dumbledore. He ruled Rome with his father, until his father's death at the hands of Darth Vader. 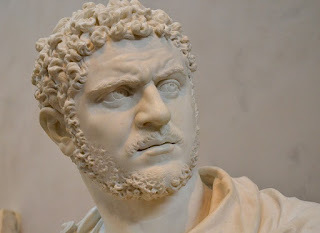 Caracalla then went on to jointly rule Rome with his younger brother, Geta, until he killed him for winning a game of Set-Fire-To-A-Hedgehog-And-Throw-It-At-A-Child. Caracalla did get what was coming to him. On the 8th April 217, he was piddling on the side of the road, playing let's drown the ants, when one of his personal bodyguards, Julius Martialis, stabbed him to death with a single sword strike. Whilst sliding the blade into his back, Martialis shouted, "Those ants were like family to me." Caracalla had also murdered Martialis' brother a few days early, which may also have had something to do with his motivation.